The Beatles Song Of The Day is- Don’t Let Me Down. Don’t Let Me Down was the b-side of the Get Back single and was written by John Lennon. 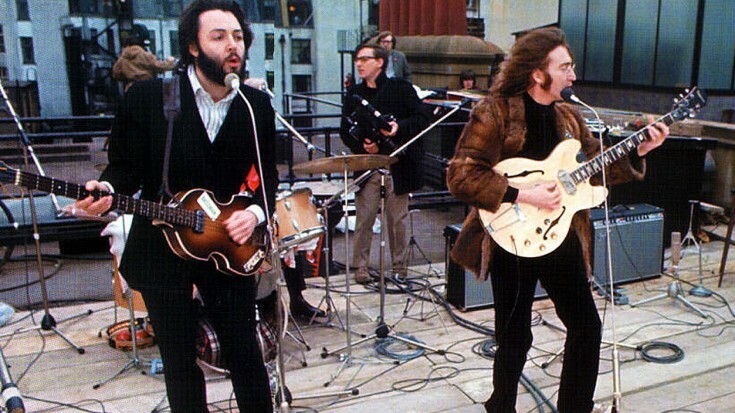 It was also played on the famous roof top concert. Phil Spector dropped it from the Let It Be album. It was added onto the Let It Be .. Naked album that came out early this century. It is also on the Past Masters II album. It is a song John wrote about Yoko who he was about to marry when the song was written. Due to a childhood where his parents both deserted him- John always had a feeling of insecurity and had anxieties about being rejected. Here he was in a relatively new relationship with Yoko Ono and the old feelings were resurfacing in the song. I have always liked the raw emotion of the song, very powerful. John Lennon: lead vocal, rhythm guitars: Paul McCartney: bass guitar, harmony vocal: George Harrison: lead guitar, backing vocal: Ringo Starr: drums: Billy Preston: electric piano: Produced by George Martin. rating of “Don’t Let Me Down” ***** stars out of 5 stars- a classic. Don’t Let Me Down was the b-side to the #1 hit Get Back. recorded on January 28, 1969. Spignesi and Lewis rank Don’t Let Me Down at #83 in their Top 100, critic Wyman has it #117 out of 213. Rolling Stone ranks it #46 in their Top 100 Beatles songs, The Beatles Channel Listeners Poll ranks it #27, Jim Beviglia in his book #86. I always liked Don’t Let Me Down over Get Back- while both are great. It would have made Let It Be a better album… great song. Dropping this song from the album not one of Phil Spector’s great decisions. I do wish they would have left it to George Martin or even Glynn Johns… I’m not Spectors biggest fan. He didn’t do as bad as some say but it could have been better. Phil worked best with minor artists and his best work at this point was behind him. They got involved with egomaniacs at the end with Phil and Allen. He turned it into the opposite of what it was going to be…back to roots. They let in the wrong people. I think at that time- they were all being pulled in so many directions and so many distractions- their eye was off the ball.